Me and Bobby McGee was the first Kristofferson LP record I ever bought. It was bought for my Dad because I knew little or nothing about country music, and it was 1) New and 2) Available for sale in boycotted South Africa. There was something about the face on the record cover that was captivating, even if it did belong to what I then regarded as an old man. 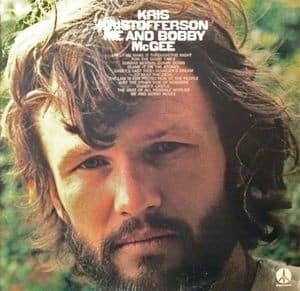 I now know that this record was a re-release of Kristofferson’s first album titled, Kristofferson, and that Wiki says it was re-released in 1971 using this LP cover because Janis Joplin’s recording of the title track was a commercial success. It seemed like a good present for my Dad because I recognised song titles that listened to. Me & Bobby McGee sounded familiar, Help Me Make it Through the Night & For the Good Times were well-known, even Elvis recorded them. Music, whether on record or tapes, was very important to South Africans growing up in this era. We were isolated by international sanctions on one side, and government censorship on the other. We only got tv in the middle of the 1970’s, and my family got their first television set around 1978. Even then there really wasn’t very much to watch other than children’s programs and the state censored news. Teenagers and young adults spent their free time listening to music. We would gather at a friend’s house, ideally somewhere that was free of adults, and crank the record player while discussing things that mattered. Older people listened to the radio during the day, and either gave or attended house parties in their leisure time. Everyone drank, most smoked. After the first few drinks, the records came out. There was a lot to discuss and a lot to make sense of for young and old alike. Boys (sons, brothers, boyfriends) were away doing their National Service, husbands and father were often away having been “called up” for camps. The Angolan/Bush War was raging, and everybody was missing someone. The guys were often angry or depressed when they came back, but it wasn’t discussed back then. When there was a shooting, a suicide or an outburst we just shrugged and dismissed the incident with the phrase, “He must have gone bossies”. We lit fires, poured drinks, and played records. When we didn’t have records, we played cassette tapes (TDK being the favoured brand) of songs that we knew by heart, even if we couldn’t always identify the artist. Every track on this album spoke to someone. 2. To Beat the Devil – Well, the old man was a stranger, but I’d heard his song before, back when failure had me locked out on the wrong side of the door – When no-one stood behind me but my shadow on the floor,and lonesome was more than a state of mind. 4. Best of All Possible Worlds – That policeman said Mr Cool if you’re ain’t drunk then you’re a fool I said if that’s against the law tell me why I never saw a man locked in that jail of yours who wasn’t just as low down poor as me. 10. For the Good Times – And make believe you love me one more time …. For the good times. 12. Sunday Morning Coming Down – I smoked my brain the night before on cigarettes and songs that I’d been picking…. & It took me back to something I’d lost somehow, somewhere along the way. Just love the artistry and poetry that comes through in all your songs Kris ,they resonate with every day battlers like myself ,very honest and sincere yet cutting at the same time ,love it . I love that this man, the greatest wordsmith of all time in my opinion, also has such a big heart. Hi Lorraine, thanks for your interest in the site. I will ask around, & I do sympathise : Copyright in this digital age can be a minefield, & it would seem there are almost as many opinions as there are songs. Perhaps Kris’ manager may be able to help cut through the red tape & find out who can give permission for a cover to be recorded & posted not for profit? Best of luck, please let us know how you get on – Both with the copyright & your project? Oh, yes! Looking in the rear view mirror can be comforting, fun & remind us of who we once thought we were 🙂 Thanks for interacting, great to see you here.